Photo fill light is simply light that fills in the shadow areas of the subject that you are photographing. It's often the easiest and most natural lighting techniques to use. I sat these two boys in the shade of a large tree. Without any fill light, their faces would come out too dark. The sun was high in the sky and off to the left. I leaned a very large, piece of white foam-board just out of camera range on the right on a light stand. 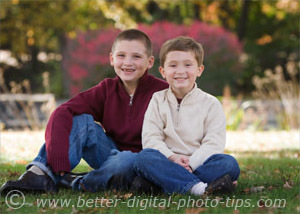 The large white surface bounced the sunlight back onto the boys' faces, providing a nice natural fill light. The main light from the was coming from the left. That light bounces off that large 3' by 5' foam-board on the right onto my subjects and softly fills the shadow areas so that the effect is very natural lighting. This series of 3 photos below shows what a dramatic difference lighting has on a photograph. Almost of the light is coming from the window behind my subject, Mr. Mannequin. The light is coming from the outdoors on a cloudy day through the window into the den. This is very strong back lighting. The first photo on the left has no fill lighting, so there is almost no detail in his face. I turned my camera's pop-up flash on for fill lighting in the middle photograph. This clearly provides the most detail in the subject even though it's not necessarily the most flattering portrait lighting. In the photo on the right, I held a large white piece of cardboard off to the right. It's still too dark on the face because the light from the window is not hitting the cardboard directly enough. Tt's more natural looking and a bit more flattering on the face, but still too dark. The third example photo in this post was shot in my client's home using a Novatron studio flash unit. The flash head is inside a 3 ft. soft box made by Photoflex. 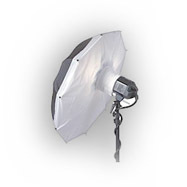 The Photoflex Softlighter Softbox is placed fairly close to and in front of my subject. Because it is a large and diffused light source, it creates a very similar lighting effect as in the first example of the boys placed in the shade, in the outdoor portrait shown photo in the beginning of this article. I used that same large white foam-board sheet as my photo fill light. I used a large alligator clip and clipped the board to a lightweight light stand to hold it just out of the camera's view. 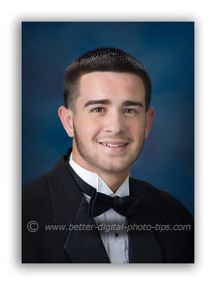 In this particular photograph of this high school senior, I also used a small hair light. If you look closely, you can see a few highlights in his hair. This hair light adds a little more dimension to the portrait. If I had not used a hair light, his dark hair, photographed against the dark background would have been too dark. You can use a lighter background to avoid the need for a hairlight. I use a Phototec 60 inch Softlighter. It's a really big light source and gives me a real nice soft light for portraits. I like it because it folds down just like a regular umbrella and can be easily transported to any location for a photo shoot. Click the photo if you want more information or you want to read the reviews from other photographers. No matter where you pick one up, you can get a good feel for how good any camera gear works by reading the reviews on Amazon. The 60 inch has a 100% 5 star review rating at the time this article was written. That is unheard of in the world of customer feedback. Photo Lighting. 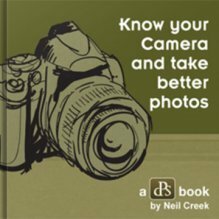 Photo lighting tips are among the hardest to master of all the things to learn on how to take better pictures. This article has more photo lighting tips about the 4 elements of light. How to Photograph People. There are a few more sample photos of natural outdoor lighting using fill lighting in this article. 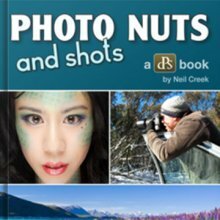 It is my intention for you to have fun while learning how to take better pictures. 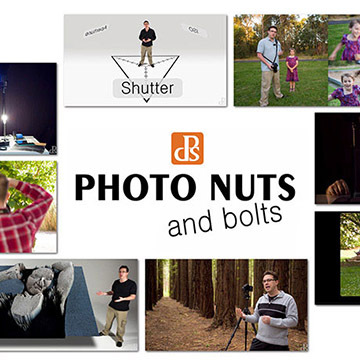 So I encourage you to have a childlike curiosity as you learn how to use photo fill light and other digital photo tips from the better digital photo tips website.